Any growing business wants and needs to gain new customers. RFP responses are an integral part of the sales process. To achieve growth, these proposals have to be managed effectively. High-quality RFP responses are key, but the last-minute nature of these requests can make it difficult for organizations to put their best foot forward. Many even miss deadlines for important RFPs—and with that, they miss the chance to win business. 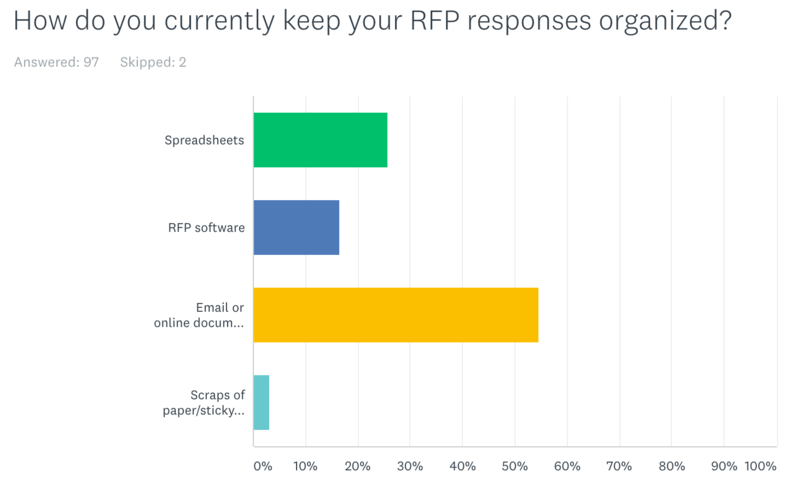 In our recent RFP response habits survey, 84% of proposal professionals revealed they are still using a manual process. Inefficiencies caused by this approach directly affect the potential of teams responding to RFPs. To identify the root cause of why organizations are missing new business opportunities, it’s good to understand what the underlying efficiencies really are. We’re investigating four common showstoppers in your RFP response process, so you can overcome them. Not being able to locate a key piece of content that’s relevant to the RFP at hand can disrupt your entire project workflow. This sends proposal managers and SMEs on an information hunt they truly don’t have time for: searching emails, folders, and spreadsheets. The effort to relocate the content is already high, but the effort to recreate an RFP response from scratch? Even higher. RFP software gives responders an intelligent answer library that both decreases time spent finding answers while providing the most relevant option. You can browse various responses for a similar question in historical RFPs and use auto-response functionality to move even faster. This way you have the power to choose a hybrid of multiple responses to customize each response for a better chance of closing the deal. Communication gaps happen—but with RFP response, the impact can mean the difference between winning and losing your next deal. If an SME overlooks an urgent request from a proposal manager by email or if a salesperson never steps out of their beloved CRM, valuable time will be lost when an RFP deadline is looming. RFP software improves collaboration between teams with specialized integrations, like Slack and Salesforce. Busy SMEs will quickly respond when a clarification is needed on a response. Busy sales teams will view everything related to the RFP project in a Salesforce dashboard, with less distractions and logins. Less email and more focus helps teams keep their eyes forward on winning the RFP together. The review process is critical for your organization, since the new business you’re chasing greatly depends on your RFP deliverable. Multiple team members are involved across departments to meet the vendor’s request. SMEs can be difficult to track down, but their expertise is a must. Once they contribute, it’s up to the proposal manager and the marketing team to make the RFP response accessible to the vendor—without sacrificing the technical points. RFP software gives complete access to the RFP’s progress and the ability to assign reviewers in the optimal order to finish the response well and on time. There is a lot less guesswork with this level of visibility, so the proposal manager can feel more confident about meeting the deadline with a quality deliverable. This eases concerns on all sides, because there is a method that systematizes the workflow. Many RFP responders discover that the time left to respond to a few queries in the RFP might take more time than what they have available. Procrastination plays a part, since responding to RFPs is typically not a primary job responsibility for the contributors. The aforementioned inefficiencies then add extra hours to the entire process. RFP software makes the workflow easier on teams, so they don’t feel the same aversions they did before with a manual approach. The proposal manager can steer the ship by assigning tasks and deadlines. SMEs and sales teams can respond in half the time, because they aren’t hunting for responses or repeating unnecessary tasks. By avoiding the last-minute scramble, the RFP response will be more thoughtful for each opportunity—and will have a better chance at winning over the vendor. Like any business process, there are inevitable hiccups that contribute to missing RFP deadlines. All of these inefficiencies can be avoided with the right RFP software, but they can be amplified with a manual workflow. When key RFP contributors work together effectively, these commons showstoppers will be resolved. Since RFP response requires an incredible amount of teamwork, there are no individuals moving toward the win. You need all hands on deck—and you need better tools to manage everything. There is no magic bullet to help every organization overcome the many challenges they face with responding to RFPs. But, the value of a dedicated RFP management tool has immediate benefits for those who work closely together with a solid process.